In the plains of the planet Ryeo lies an outpost that was only just recently abandoned for no reason at all. The outpost was made to be the first defense in a line of many to stop incoming attacks. 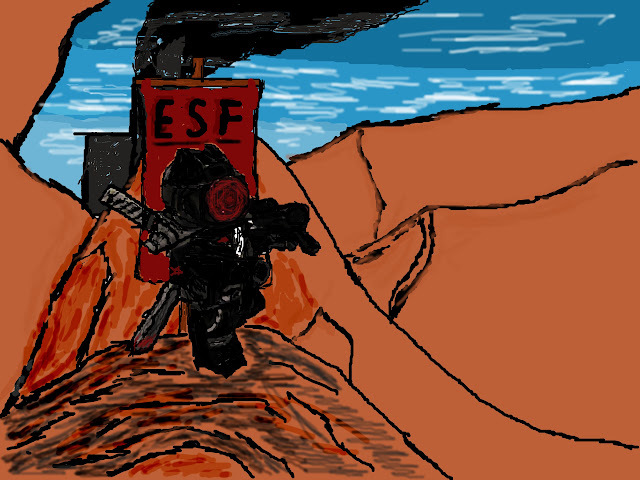 The last report from the outpost only said that they had found something worthy of the great Emperor himself and that they were creating something that could bring the Immortal war to an end. A group of USAR drop assault soldiers were dropped onto the planet form the capital ship GOLIATH. The first thing they noticed after they landed was the peach bodies strewn around. Welcome to THE FALLEN ONES forum battle where seven forum members will take control of one unit each and work together to find and destroy the force that has taken over the base. Stats will be given below and all orders and turns will be posted in this thread. from left to right: Commander, Light OTC carrying soldier, and light chainsaw carrying soldier. Armor can deflect all small arms weapons like pistols. Skeleton adds an extra 1d6 of armor if shot in side or back. These are the same stats for all other characters. Cannot be parried as everyone knows or should know. Left to right: Axe carrying soldier, and Demolitions expert. May shoot both flamethrowers each turn if he hasn't moved same with next character. Damage: 3d4 worth of damage each turn something is on fire. adds 1d6 skill to any friendly unit using a long ranged weapon. Any land mines in 1d6 area will be discovered if any are located there. Special rule for all characters: all get two actions and almost always a response action if not disrupted. Last edited by alphafalcon541 on Mon Sep 24, 2012 8:01 pm, edited 8 times in total. Anyway I am the Demoman! GIMME DAT DEMO EXPERT! Not signing up, too busy, sorry! I like the flamer weapon and the troops look superb, nice work. If Warhead isn't taking the Flamer, then I will. EDIT: Never mind. I'll take the beserker. Can I have that Light-OTC carrying soldier? Torch that peach corpse, then switch to the axe and try to stay close to the others. Can't be too careful. No brag! I have a captive we can use as well as a forced redshirt! Anywho Go around and look for stuff to shoot. Chuck a pipe bomb at that MG nest before someone pops out and opens fire on us. Also,have my character quote a line from Aliens. Last edited by Ex_Bajir on Sun Aug 12, 2012 2:53 pm, edited 1 time in total. Oh. JUST NOT MINE! In that case head for the bunker. Someone should probably also take out that machine gun on top of the bunker before someone pops up and frags us all.